QUESTION: (Via interpreter) My name is Sugimoto from Sankei Shimbun newspaper. I have questions for both Minister and Secretary. Now, at the end of – two years ago, between Japan and ROK, there was an agreement between Japan and ROK on 【"comfort women"】 issue. And as both of you have mentioned, that Japan, U.S. and ROK needs to closely work with each other, but with the 【"comfort women"】 issue still being at the present, the Japan-ROK relationship is not that good right now. 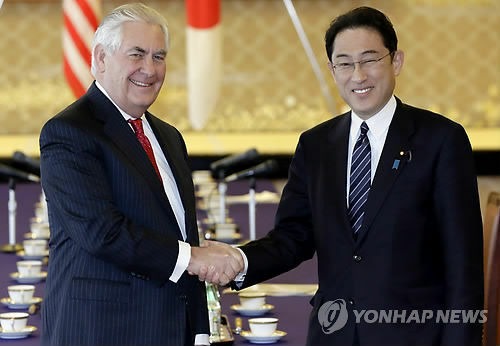 So how have you asked the understanding of the United States on the Japan-ROK agreement? How will you be further developing the relationship with Korea? QUESTION: (Via interpreter) My name is Sugimoto from Sankei Shimbun newspaper. 5. Gazebo = Paul MAZZOLINI (1960-) ist ein italienischer Musiker.